I purposely left my peas planted this year, long after I'd finished picking them, so that the leftover peas could dry out enough to be saved for next year's planting. 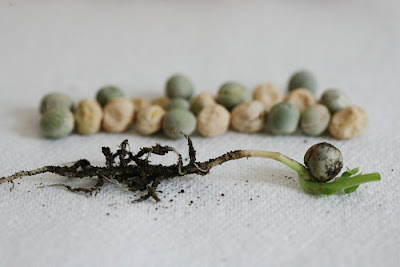 (This took longer than I thought it would, as interestingly enough the pods were the last part of the plants to stay green - the plants seemed to direct most of the water and nutrients they absorbed to the pods and peas). Today they were finally dry enough. I managed to find about 20 (see pic) that I can save for next year, and as I was scrounging around I pulled up what I though must have been a weed... nope! A fallen pea had started the next generation of plants already (foreground of pic).